These Girl Scout cookies aren’t so sweet. Little Brownie Bakers, makers of the addictive little treats, If you’re a Girl Scout Cookie fan and thought the Lemon Chalet Creme cookies you ate were a bit off — no problem with your taste buds, rectangular cinnamon-ginger lemon-filled cookies- 14 cookies* per 8 ounce box. 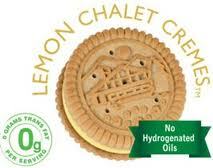 Curious about how many calories are in Lemon Chalet Cremes? View nutrition labels and calorie data. Ingredients: Enriched flour (wheat flour, niacin, reduced iron, thiamine mononitrate [vitamin B1], riboflavin [vitamin B2], folic acid), sugar, vegetable oil (soybean, palm, palm kernal, partially hydrogenated soybeen and/or cottonseed oil with TBHQ for freshness), dextrose, contains two percent or less of invert sugar, salt, molasses, cornstarch, natural and artificial flavor, citric acid, baking soda, soy lecithin, cinnamon, whey, anatto color, turmeric color. Dietary Exchange: 1 carbohydrate, 1/2 fat.